Get Windows 8 Pro Upgrade for US$15 or Singapore $18 only! Microsoft is currently offering upgrades to Windows 8 Pro for a flat S$50, as long as you’re using Windows XP or later. The promotion runs through January 31, 2013, and applies to purchases made through Windows.com. And there is a way to obtain a further discount the price to get it for S$18 only, a good 64% discount off the upgrade retail price. Visit the following Microsoft website (http://www.windowsupgradeoffer.com/) for the Windows Upgrade Offer. This is only applicable for PC purchases post June but currently, Microsoft are not performing any checks on their end so you could apply for the discount as well. Update: The loophole has been plugged. Microsoft now asks for a valid Win 7 key to check before it issues the CD-KEY. Enter your “new” PC – random model number and manufacturer with purchase date after 01 Jun 2012. It is as simple as that. Windows 7 users that are currently on ‘ahem’ enterprise or OEM versions are entitled to this upgrade offer as well. This is a great deal that you should quickly grab before Microsoft stops the discount or add in additional checks. You would need to have an existing Windows XP to Windows 7 installation in order to run the Windows 8 Upgrade. Windows 7 users can upgrade from any consumer edition and bring along their settings, personal files, and applications. Windows Vista users can only bring along their settings and personal files, but not their applications. Windows XP are the most limited and can only keep their personal files, but no surprises there. Also, all users have the option to perform a clean install. The Windows 8 system requirements are similar to Windows 7. 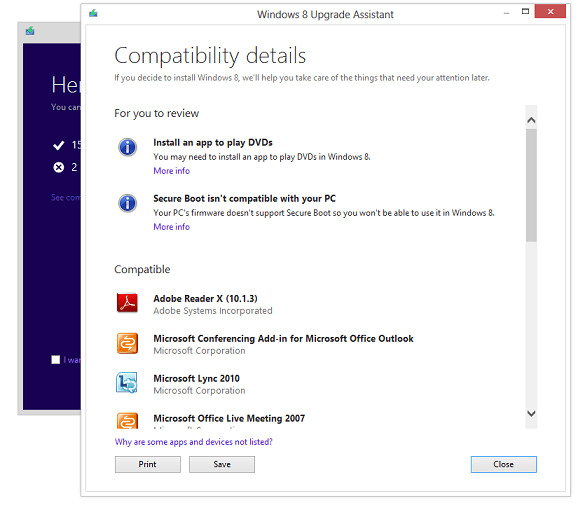 In fact, just run the Windows 8 Upgrade Assistant and it will help prompt you on areas if your computer is not compatible. It will provide a detailed compatibility report that lets you know of anything you may have to address before or after the upgrade and outlines actions to take. The upgrade assistant was useful in providing useful reminders like de-authorising my computer for iTunes as the data would be lost after upgrading. And yes, if you are wondering if you can use the Upgrade version of Windows and do a clean install Yes, you can! Use the USB Drive or DVD that you created. Boot up via the installation media and you have the option to delete off the Windows 7 partitions etc and install Windows 8 to a fresh new hard disk. Basically, with the Windows 8 Pro license, you are entitled to a full version of Windows 8 Pro. You could also download the ISO from MSDN if you do not have the file created. If you choose to proceed with the digital copy, the Upgrade Assistant would start to download the upgrade files. After the download finishes, you can choose to proceed with the upgrade (“Install now”) or install later either from your desktop or by creating your own media. If you choose to create your own media, you will be able to create your own bootable USB or .ISO file which can be burned onto a DVD for upgrade and backup purposes. That is quite useful and highly recommended to do. At least create the backup .ISO. If you are looking to run the upgrade again after creating the .ISO, look in the following hidden folder (C:ESDWindows) for the setup.exe. With Windows 8 now less than $20, now’s a great time to upgrade. I got 10 min and 22 sec of my download more to go and will update you soon on the Windows 8 user experience. I doubt I will be doing a clean install for now and see how the Windows 8 upgrade proceed.